Another dog died on the Iditarod Trail Wednesday morning, making the 2017 race to Nome the deadliest for its athletes in almost a decade. Shilling, a 3-year-old male running on the team of rookie racer Roger Lee, collapsed and died about 10 miles before the checkpoint of Unalakleet at 10:30 a.m. Wednesday, according to a press release from the Iditarod Trail Committee. 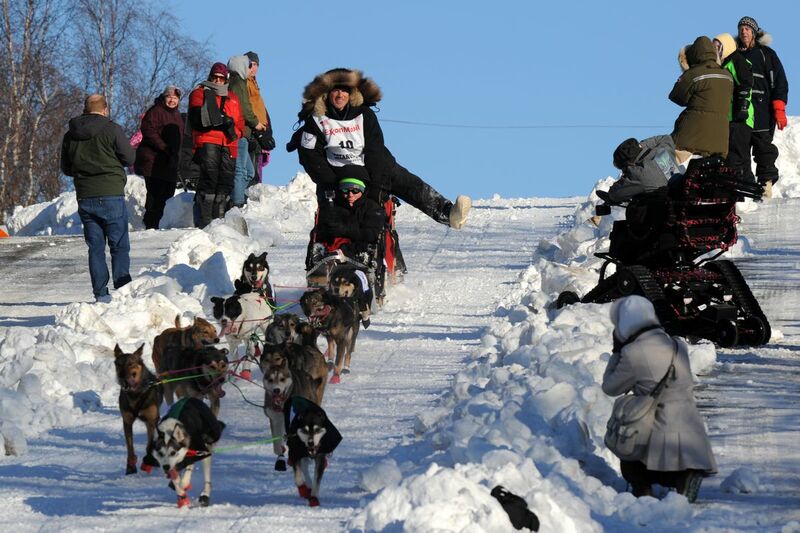 Lee, a rookie from Birkenhead, England, remained in Unalakleet Wednesday afternoon in 62nd place. The death is the third dog to collapse on the Iditarod Trail this year and the fourth overall to die. Dogs on teams for veteran racers Katherine Keith and Seth Barnes both collapsed en route to Koyuk and Galena, respectively. A dropped dog died after overheating on a cargo flight from Galena to Anchorage. Another dropped dog was struck and killed in Anchorage after it was released from Iditarod care — and thus is not counted as among the dogs that perished in the race. The death toll is the most since 2009 when six dogs died during the Iditarod. There were no dog deaths from 2010 to 2012. Before that, the race averaged about one dog death a year. "We're just gathering information. I don't know anything more," said Iditarod Race Marshal Mark Nordman said while standing near the finish line in Nome. "It's a saddening time. It's the worst that we can deal with. We're trying to improve and as I said, we're going to find out what happened." Oklahoma State University sled dog researcher Mike Davis said part of the reason for the streak of years without fatalities is improved research and knowledge among the mushing community. Davis spearheaded research that found giving gastric acid suppressants like Prilosec to dogs on a empty stomach helped to significantly reduce gastric ulcers, previously a common cause of death in long-distance sled dogs. Davis credited mushers in reducing deaths along the trail by improving their own knowledge of nutrition, dog care and the warning signs for fatal conditions. Davis, who has followed the recent dog deaths through the press releases and media reports, said with limited information, it's impossible to speculate about possible causes. He said researchers know much less about dog physiology than human physiology and thousands of things could cause a dog to collapse and die. He noted in recent cases even after pathology testing, the cause of death for collapsed dogs was unknown. Without any clues he said it's impossible for researchers to find the source of the problem. "I'm sure the race is frustrated. I'm sure the individual mushers are very upset because none of them want to lose a dog for any reason," he said in a phone interview Wednesday. "I expect a lot of these folks are really interested in devoting as much effort as they can to fixing it. The problem is that they don't have a direction to put their efforts yet." The Iditarod noted in its press release Wednesday a necropsy will be done to determine the cause of death. Lee is racing with a team from veteran musher Scott Janssen's kennel according to a biography provided by the Iditarod. Lee, who is on sabbatical from the U.S. Air Force, has worked as a dog handler since 2006.